Our banner graphics are ideal for creating really high impact outdoor advertising. Whether you need a simple sign featuring your logo or a full colour photographic image we have the technology. We print and meticulously hand-finish all our PVC, mesh banners, Monsoon and backlit flex banners in-house using only the best quality materials. They are incredibly versatile and offer many advantages, for example, you can have your banners made to virtually any size. Really large banners can be mounted on tension frames to make sure they stay looking good and firmly in place. The materials we use are fade and wind resistant and our printers produce super-high definition images and logos. Banners are one of the quickest and easiest promotional graphics to install and are one of the most cost-effective forms of outdoor advertising too. Large format banners are perfect for creating a big impact if you are promoting a fair, festival or sporting event for example. 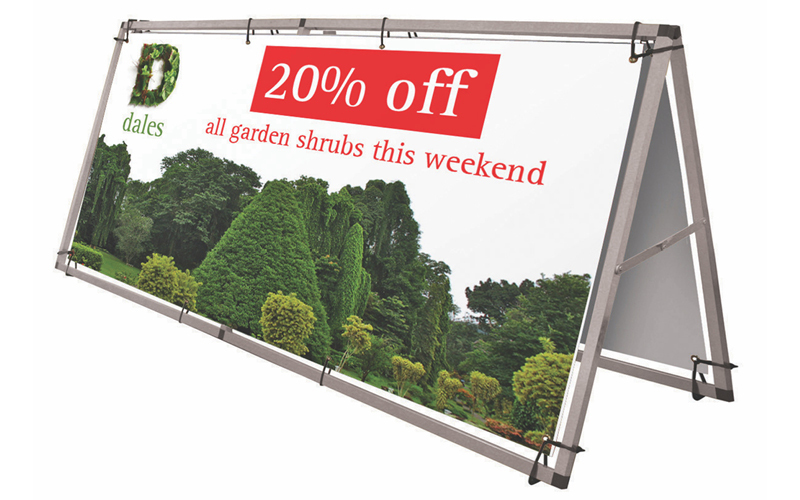 Our banners can be fitted to railings, between posts or mounted onto their own self-supporting frames. Other outdoor events we produce banners for include elections and protests. We’ve helped local and national political parties of all persuasions promote their manifestos! As well as helping you to promote your construction project or new development, printed banners can make a big difference in how professional your site looks. Large, colourful and informative banner graphics can really set your scheme apart from your competitors. A well-designed banner is a very cost-effective, large scale form of advertising. We digitally print hundreds of banners for car dealerships up and down the country every month. They are very popular with the automotive sector because they are so simple to design, they can be produced and replicated easily and can be placed almost anywhere. Our car dealer clients tend to prefer the larger sized banners because they have bigger spaces to fill and as the automotive industry is so competitive, they need their banner messages to shout that little bit louder. Exhibition organisers often use our outdoor banners not only outside to promote their events but inside the exhibition halls too. We use different grades of PVC depending where the banner will be used. As well as supplying organisers, we supply all sizes of banners to the exhibitors themselves. The advantage of banners when exhibiting is that they can quickly be erected and then just as easily taken down after the exhibition and re-used elsewhere or stored carefully away. CSDPrint produces stunning, high-quality banners of any length using heavyweight PVC or mesh. All of our banners have hemmed edges and either eyelets or pole pockets for a pristine, professional finish.